The Edric Theatre, within Borough Road Building, is our dedicated theatre and rehearsal space for drama, performance and technical theatre students, which is also available for commercial hire. Take a tour of the Edric Theatre. "It provided a vital resource for our large community cast rehearsals. In keeping with the South Bank's reputation for world-class performing arts, the Edric Theatre provides a contemporary performance space and a theatre that's first-rate. Whether it is hosting live music, contemporary dance, film or drama, the venue is set to become a regular in the rehearsal or performance circuit for local and national acts. 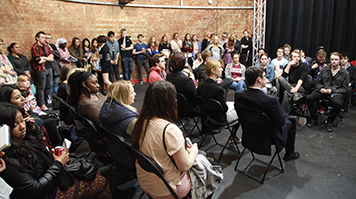 It's also the place to catch the latest urban productions to come out of LSBU." Find out more about hiring facilities at LSBU. LSBU is committed to equal access across campus. Read our Edric Theatre access guide on DisabledGo to see a summary of the theatre's accessibility and key features. The LSBU Student Theatre Company's first production took place in 2011 and was one of the first performances in the refurbished Edric Theatre. 'Insecurity guards', a scapegoat and a singing polar bear, are just three of the surreal characters to be found in their version of Anthony Neilson's tragicomedy The Wonderful World of Disoccia, first performed at the 2004 Edinburgh International Festival. In collaboration with a professional designer and production manager, together with professional director Jon Lee, 38 students formed the cast and crew of this contemporary production. For the first time an audience got to experience the newly fitted out theatre. For the performance, all spaces were fittingly dressed in an airport theme, including an airport lounge reception area, tickets disguised as boarding passes and a passport programme. Each year the Student Theatre Company delivers in a full season of theatre working exclusively with theatre professionals including directors, performers and theatre companies. Frantic Assembly (a progressive alternative theatre company) are the 'company in residence' and work with the Student Theatre Company to deliver highly original, thrilling and energetic devised pieces during a week-long residency.